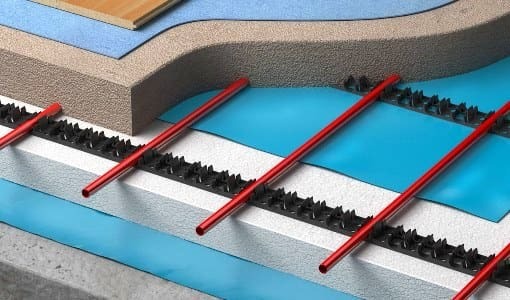 Water, also called wet or hydronic underfloor heating systems are a popular choice for extensions and new constructions. The system uses water for heating, so it can be linked to virtually any heat source from a standard boiler to newer sustainable technologies, such as solar thermal energy or heat pumps. Each system we provide is tailored during the project’s design stage to get an optimal balance between the system performance and efficiency. Once complete, the lifetime warranty on our heating pipes provide true peace of mind that the system will continue to perform. 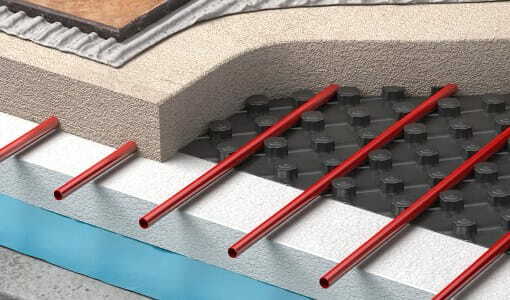 The Warmup Metro System is designed for use within floating and bonded screed floors allowing for quick, consistently spaced installation of the pipework. The Warmup Silva System is designed for use within either battened or suspended timber floors that are constructed using traditional joists. The Warmup Econna System is designed for use over both battened and joisted floors, leaving the void between them free for other services. 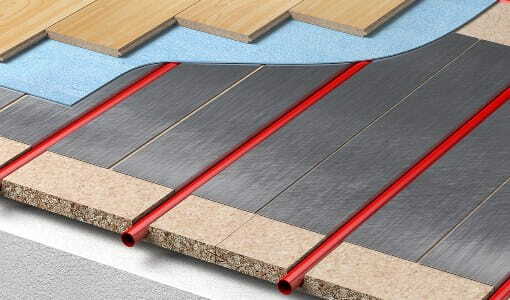 The Warmup Tectora System is designed for use within battened and suspended timber floors, including TJI joist constructions. The aluminium diffusion plates ensure responsive, efficient heat. Warmup wet heating systems come designed and supplied with a full set of high-quality components and controls ready for installation. Systems are available in a number of configurations and components guaranteed to perfectly match your project and budget. The Warmup product selector will guide you in the right direction when choosing the best water heating solution for your project. 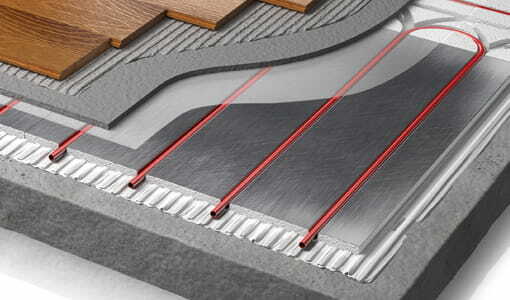 Water underfloor heating is usually installed within the subfloor construction of a building. Before starting the installation make sure to read the installation manual and follow it every step of the way. The area must be dry and the insulation must conform to building regulations or practice and again, laid as per manufacturer’s instructions. Clypso System is designed for floating screeded floors and does not get affected by changes in the floor covering whether wood, carpet or vinyl. 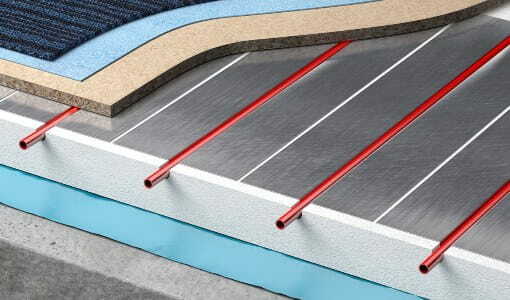 The system comes with laminated insulation panels for efficient heating. Total-16 System is popular for its low build solution, featuring a 12mm pipe and a 16mm total build up. With aluminium diffuser plates, it can be quickly installed onto either concrete or wooden sub-floors and under almost any floor finish. If you are looking for an easy and quick installation of a wet system, Warmup also offers a water underfloor heating kit. The HydroPack System allows for a fast installation of a wet underfloor heating system containing everything you need to install the system in hours. Total-16 water system is popular for its low-build solution, featuring a 12mm pipe and a 16mm total build-up. 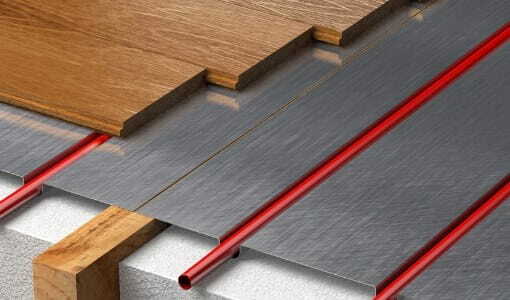 With aluminium diffuser plates, it can be quickly installed onto either concrete or wooden sub-floors and under almost any floor finish. If you are looking for an easy and quick installation of a wet system, Warmup also offers a water underfloor heating kit. The HydroPack allows for a fast installation of a wet underfloor heating system containing everything you need to install the system in hours. What Is the Cost of a Water System? Water underfloor heating is a highly cost-efficient heating system to run as it uses much less energy than a central heating system. 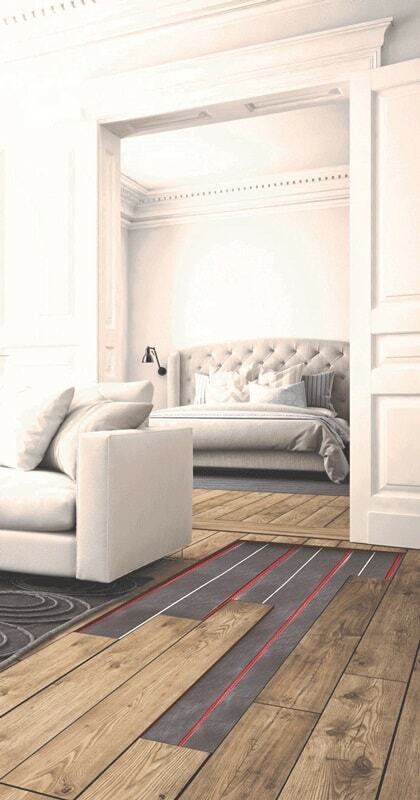 Wet underfloor heating emits enough energy to bring your room to your comfort temperature at flow temperatures of 30-40 degrees. This is significantly less than the temperatures required by conventional radiators to bring your room to comfort temperature (60-70 degrees). This is due to the fact that hydronic heating systems spread the heat evenly across the floor surface and emit radiant heating through the objects of the room. Water systems are particularly popular in energy efficient new build houses. 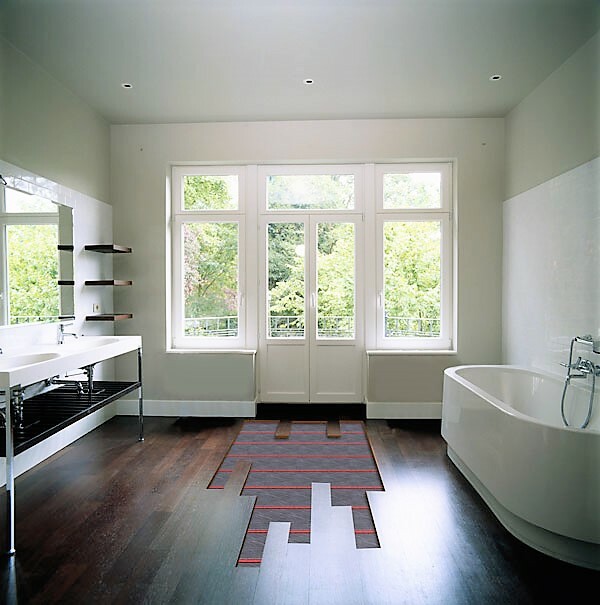 You can calculate the running cost per m2 of your wet underfloor heating system here. Warmup PEX-A hydronic pipe carries a Lifetime Warranty for greater peace of mind. All other pipes carry a 50 year Warranty. Our unique SafetyNet Installation Guarantee means that if you accidentally damage the pipe on site, Warmup will exchange it with a new one free of charge.